Recently, I received my first ever beauty box from Love Me Beauty. 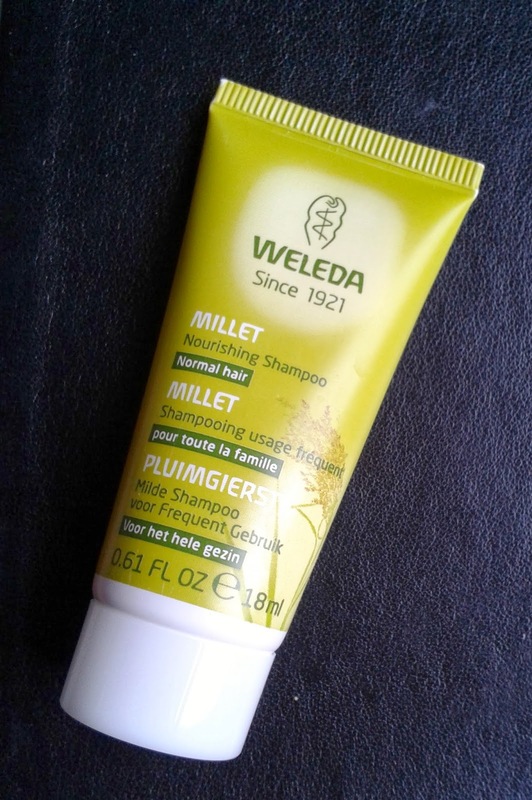 I was excited to try new products, but mostly the sample of the Weleda Millet Nourishing Shampoo that was included. Not for any other reason except that I was running out of shampoo quickly, and it would be a nice way to prolong the inevitable shampoo-shop! As I'm a transplant from the US to the UK, I didn't bring any full-size shampoos with me. Even if I did, I wouldn't know what to bring! I am eternally jealous of those who have "holy grail" items that I don't (though I do have some great holy grail styling products). Frankly, I bounce around from shampoo to shampoo (and the same goes for conditioner) without much concern for what I'm trying to achieve with my hair or how effective it is. However, I did bring over a travel size of Garnier Fructis Fortifying Shampoo, and wasn't very happy with it. 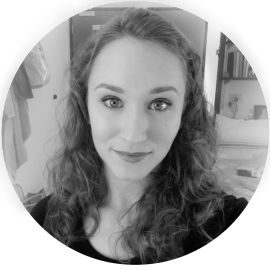 It seemed to strip my hair of moisture, which made my scalp overproduce oil, and got me in a nasty cycle of washing my hair every other day (usually I like to go two days between washes). A little insight on the state of my hair pre-Weleda: my scalp is distressed, my hair is prone to breaking (this due to a variety of factors: curly hair, a tendency to pull it out of a braid or bun when revising, terrible nutrition, stress, etc. etc. ), I find that it is dry and static-y, and brittle. Despite this it would become extremely oily at the roots after the first wash.
Millet nourishing shampoo for normal hair contains organic macadamia nut oil and extracts of organic millet husks and sage to provide gentle cleansing to nourish and maintain the hair's natural suppleness. Suitable for the whole family. Suitable for vegans. The shampoo is sweet and vibrant, with extract of grapefruit and peppermint, layered with mild, woody amyris. With macadamia nut oil to add a calming, lightly conditioning element, this shampoo is ideal for all the family. In case you're wondering what on earth millet is (because you know I was!! ), it's a small-seeded grass grown for cereal crop and grains. Who knew? I used the shampoo this morning when, right on time, I had run out of my travel portion of shampoo. The shampoo itself has a, shall we say, interesting smell. It smells a bit like sticky-sweet soda syrup and herbs. I know! It's strange but that's the only way I can describe the smell. Combine millet, sage and macadamia oil (the main stuff) with all of the extra scents such as grapefruit and peppermint (a lot more stuff) and it's just really interesting. I think it might put some people off, so just bear that in mind if you have a sensitive sniffer. I was also surprised by the lather. I didn't see anything on the tube about being SLS free, but it does not lather. Nowhere is any sulfate listed in the ingredients. I haven't used an SLS free shampoo in a while, and it took some getting used to in the shower. It does take time to really massage into your roots, but it's always nice to give yourself a little head massage in the morning. I also found that I actually used less shampoo than my old lathering one. I wasn't sure how much it was actually cleaning my hair until I rinsed it out, and it felt clean, but not stripped, crunchy, or dry. Hair like WOAH. Look at how soft and shiny and sweet it looks! No crunch. Just soft curls. I'm in love. And yes that is a Kansas City Royals shirt. I have to say, this is the softest my hair has ever felt. And it feels CLEAN! If you can get past the smell, it's definitely worth it for a no-fuss shampoo. It's just a good all-round shampoo, suitable for most hair types (mine definitely isn't normal, and this still worked wonders), and great for all you vegans in the world. I can't speak to its ability to quell the oiliness that seems to come with a vengeance after day one of shampooing, but I'll let y'all know. Weleda Millet Nourishing Shampoo is available from Weleda's direct website and retails for £8.95 for a full size of 190ml.